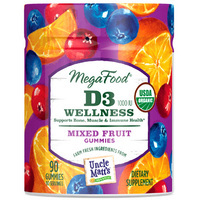 D3 Wellness, 90 mixed fruit gummies (Mega Food) - Penn Herb Co. Ltd.
Fresh-picked Florida oranges, Wisconsin cranberries, Quebec blueberries and Kauai ginger root—a bountiful blend!—give our gummies a real boost in flavor and color, while 1000 IU (25 mcg) of FoodState® Vitamin D supports bone, muscle and immune health. MegaFood® Gummies are made with real, whole foods sourced from farm fresh partners to deliver a range of health-promoting compounds—no high fructose corn syrup, gelatin, artificial flavors, colors or preservatives of any kind. Supports bone, muscle and immune health.